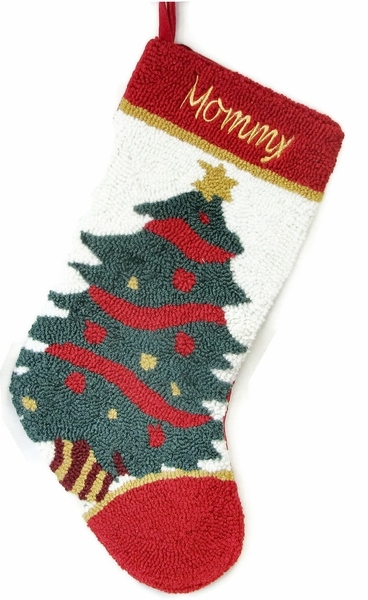 20" Christmas Stocking - wool hooked Christmas Tree design front. Back is red velvet, inside is lined with cotton fabric. Personalized on the cuff. We suggest personalization in either WHITE, GREEN, GOLD or SILVER thread so the name would stand out. On these hooked stockings we discourage use of the Block embroidery font as some letters in Block embroidery font are thin and tend to dissappear inside of the loops. So for best results, choose Script or Hand font ! Personalized Christmas Tree Stockings - Hooked Wool Christmas Stockings. This is 20" Velvet Christmas stocking with a Hooked Christmas Tree Design. Complimnetary designs of Hooked Christmas Stockings are available so you can make a set. Choice of fonts: Embroidery Script Font or Embroidery Hand Font.